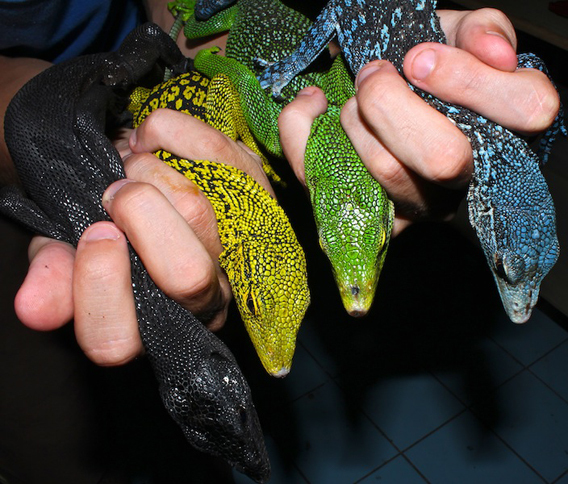 Illegally traded lizards (left to right): black tree monitor (Varanus beccarii), Reisinger's tree monitor (Varanus reisingeri), emerald monitor (Varanus prasinus), and the blue-spotted tree monitor (Varanus macraei). Photo courtesy of Jessica Lyons. Demand for exotic pets is driving the illegal harvest and trade of herpetofauna (reptiles and amphibians) in Indonesian New Guinea, according to a recent study published in the journal Biodiversity and Conservation. Wild carpet pythons (Morelia spilota) are traded on a legal quota system, but researchers say the quota is often exceeded. Photo courtesy of Jessica Lyons. Between September 2010 and April 2011, Daniel Natusch and Jessica Lyons of the University of New South Wales surveyed traders of amphibians and reptiles in the Indonesian provinces of Maluku, West Papua and Papua. The authors encountered a slew of species being exploited for trade including: the green python (Morelia viridis), boelens python (Morelia boeleni), frilled necked lizard (Clamydosaurus kingii), New Guinea snapping turtle (Elseya branderhorsti), blue tongue lizard (Tiliqua scincoides), the green tree frog (Litoria caerulea), and several species of monitor lizards (Varanus sp.). 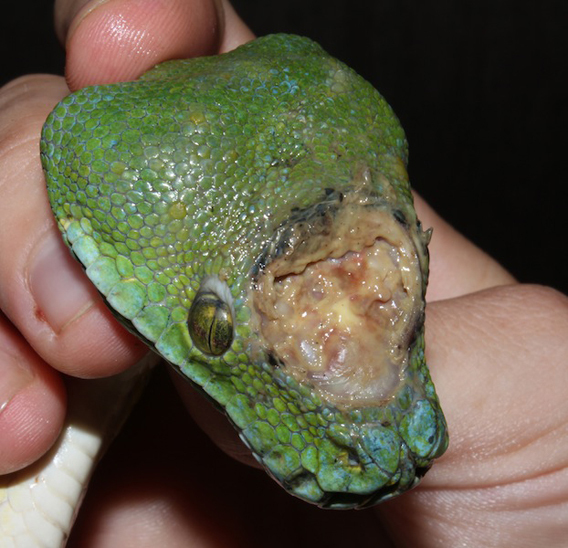 Illegally traded green pythons (Morelia viridis) in the black market pet trade. Photo courtesy of Jessica Lyons. According to the paper, they recorded, "5,370 individuals representing 52 species collected solely for the pet trade. At least 44 % were either fully protected or had not been allocated a harvest quota, making their harvest and trade illegal. Approximately half were listed within the Convention on International Trade in Endangered Species of Wild Fauna and Flora (CITES)." 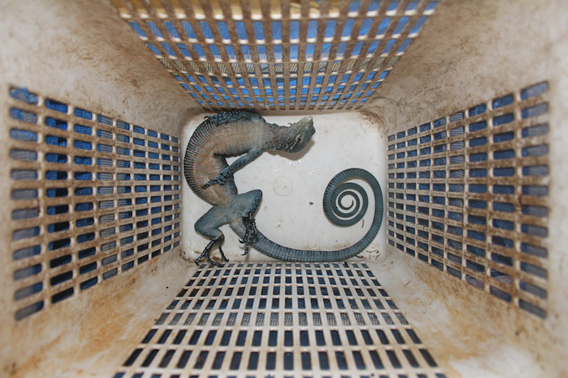 Illegally traded blue-spotted tree monitor (Varanus macraei) in a crate. Photo courtesy of Jessica Lyons. The Directorate General of Forest Protection and Nature Conservation (PHKA) is responsible for the monitoring and enforcement of CITES regulations in Indonesia. Natusch and Lyons' findings suggest that there are some key gaps in PHKA’s enforcement. "Illegal trade is due, partly, to an inadequate understanding of the species being traded and is facilitated by poor monitoring and enforcement at key trade hubs," they write. A 2011 paper, also by Lyons and Natusch, focusing on the illegal laundering of green pythons asserted similar findings. A report submitted by Indonesia at the CITES Asian Snake Trade Workshop in 2011 claimed that there was no illegal trade in Indonesian snakes. However, Lyons and Natusch uncovered a different story—that breeding farms were being used to illegally launder wild caught snakes. 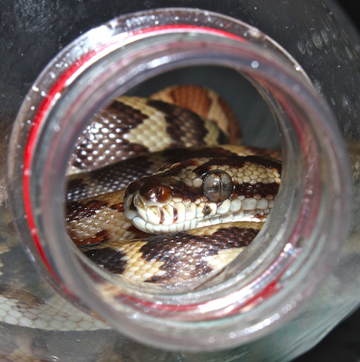 Illegally traded green python (Morelia viridis) with head injury likely due to being in a cramped, wet cage. The snake may have rubbed itself raw trying to escape. Photo courtesy of Jessica Lyons. 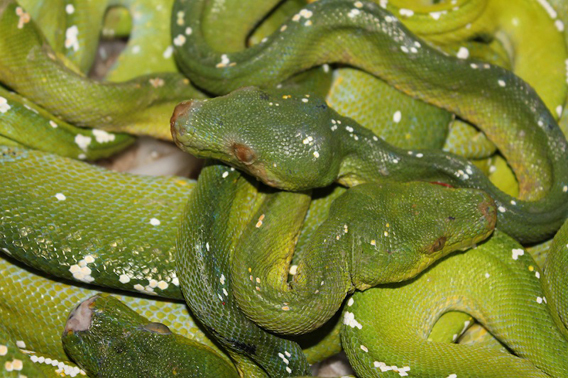 Between April 2009 and Sept 2011, the authors surveyed traders who supplied the market for green pythons (Morelia viridis). Commercial trade in green pythons is legitimate when the traded individuals are bred in captivity, but harvesting green pythons form the wild is strictly illegal. However, it appears that many traders are taking advantage of an inadvertent loophole in the system. Local collectors harvest snakes in the wild, and sell them to breeding farms, which pass these snakes off as captive bred. "Extrapolation of monthly collection estimates provided by traders revealed that at least 5,337 green pythons are collected each year, suggesting that at least 80% of the green pythons exported from Indonesia annually are illegally wild-caught," the scientists wrote last year. The authors suggest many methods to counter the laundering of illegally caught wildlife. One novel method is ensuring that the snakes are sold along with their eggshells, which can be measured to verify authenticity. "Merely the requirement of having to enclose eggshells within shipments (and not even measuring them) would curtail much of the trade," Lyons told mongabay.com. As of yet, this method has not been implemented. In addition, Natusch and Lyons recommend, "the need for increased monitoring and enforcement, improving the knowledge base of species traded and educating consumers about the effects their demand for pets has on these species."